We knew next to nothing about Prague, so after breakfast we headed out to Old Town (UNESCO World Heritage Site—the Historic Centre of Prague) to hook up with the Sandeman's New Prague free walking tour (like we do in any city we can). Hannah, our guide for the day, knew a lot about Prague's deep history and packed a ton of information into the two-and-a-half hour walk through the city center. Like many European cities, Prague was founded on the banks of a river (in this case the Vitava). The earliest settlement of the area dates back to 1306 BCE by a gent named Boyya, and the region was called Bayonheim—a word that eventually turned into Bohemia. 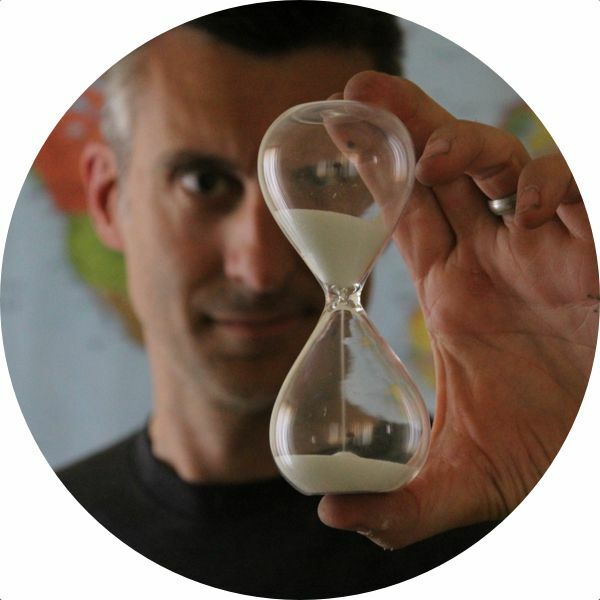 A lot of stuff happened in the area over the next few thousand years, but Prague really took off when Holy Roman Emperor Charles IV made Prague the capital of the Empire. 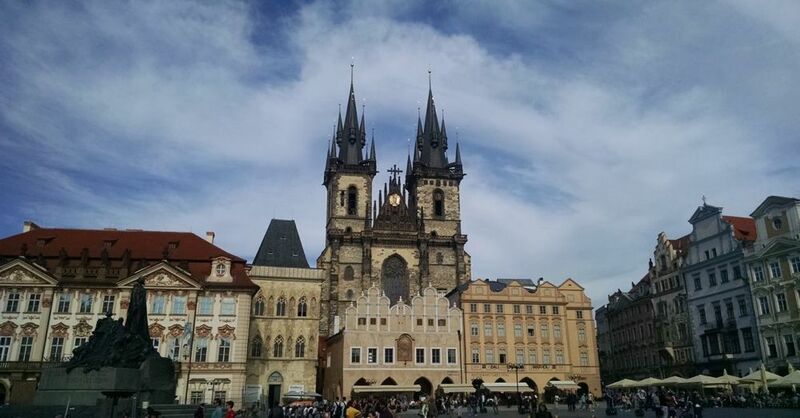 The tour started in Old Town, home to the Church of Our Lady before Týn, the Astronomical Clock, a statue church reformer Jan Hus, and scads of performance artists. Our first stop on the tour was this Gothic church right in Old Town, which, with its twin towers, is possibly the most recognizable landmark in the City of a Thousand Spires. Just a few of the spires in the City of a Thousand Spires. This (currently) Roman Catholic church was built right over the top of a previous version of the church starting in the 14th century, likely around the time Charles IV declared Prague to be the capital of the Empire. The spires of the church are notable because of their differing sizes—they represent the feminine and masculine aspects of the world. And the men in charge of building the thing decided that the feminine spire should be a little smaller. Across the square from the Church of Our Lady stands the Old Town Hall, another iconic Prague building that dates back to 1338, when it was built using taxes levied on the sale of wine. This building always attracts a large crowd because of the famous Astronomical Clock, what some call the 2nd most overrated attraction in all of Europe (and I bet you can guess what the first is). The clock was installed in 1410 and features an astrological and zodiacal clock, a calendar, and a Czech name day clock, as well as many detailed statuettes, including a procession of the 12 apostles and four other figures representing the ills of its day (vanity, greed, death, and entertainment) that animate when the clock strikes on the hour. When we first went by, we'd just missed the striking of the clock (as you can see by the position of the hands in the photo), but Hannah circled us back later on the tour so we could see the whole animation. Jan Hus was a priest began speaking out against some of the more egregious practices of the Roman Catholic church, like the Crusades and the practice of selling indulgences (paid passes to forgive committed sins). His speeches and writings didn't make the church happy, so the Papacy, which was already having enough problems (this was an era of many antipopes), eventually had enough of Hus. Hus was burned at the stake on July 6, 1415, so the 500th anniversary of his death will be taking place in just a few weeks from this writing. While we were there, there was some work being done on his statue to spruce it up for the quincentenary. His execution sparked the Hussite Wars, a 15-year period where his followers rebelled against the absolute religious rule of the Pope. The Pope, in turn, issued a Papal bull that all followers of Hus be slaughtered and sent waves of crusaders to the Czech lands—but they all lost to the Hussite forces. Eventually an uneasy peace was agreed upon between the church and the people of Bohemia and everyone lived , at least until the Thirty Years' War. Defenestration is defined as throwing a person out of a window, and this is a thing that they do in Prague when religious freedom is on the line. It happened at last twice, once during the Hussite Wars and once to start the Thirty Year's War. The first defenestration took place back during the Hussite Wars in 1419. A protesting group of Hussites stormed the Old Town Hall and threw the city officials out the window. It wasn't that high, and not all died from the fall—but those that survived were brutally killed by the mob of people protesting int he streets. The second took place in 1618 when four Catholic Lords, who were trying (again) to force Catholicism on the lands of predominately Protestant Bohemia were thrown out of a third-floor window of the Bohemian Chancellory. They lived, as the story goes, by landing on a large pile of manure. So, after a lengthy period of religious tolerance, a gent by the name of Archduke Ferdinand of Austria was elected as the new Holy Roman Emperor as Ferdinand II. (Note: this was not the Archduke Ferdinand of Austria whose assassination in 1914 sparked World War I.) No, this was the Archduke Ferdinand who started the Thirty Years' War—a violent and bloody confrontation between Protestants and Catholics that engulfed much of Europe for about, well, 30 years—in part due to this second defenestration. Interestingly enough, today, the Czech Republic is 80% atheist or agnostic. After we left the the Old Town square, Hannah took us around to some other interesting Prague spots in Old Town, like the Estates Theater, where Mozart first performed Don Giovanni, which was written specifically for the people of Prague. The theater was undergoing some renovation, so there were no good picture opportunities, but we did take a stroll over to the House of the Black Madonna, a cubist building that houses a cubist museum and a cubist café. It's called the House of the Black Madonna because of the figure of a black Virgin Mary that sits in the corner of the building. The image of a black madonna is an interesting phenomenon, something we'd first seen with the statue of the Virgin of Montserrat in the Barcelona Cathedral. I didn't get a good shot of the Prague Madonna herself because, well, broken camera and all. I thought there might be a chance we'd swing by later, but we didn't. Fortunately, there's the Internet. Conversely, we did get plenty of good shots of the Powder Tower, one of 13 city gates in Prague, and it marks the border between New town and Old Town. It's also marks the place where all the touristy shops begin. It was built back in 1475 as an attractive entrance to the city of Prague. It's made of sandstone, which has turned black over the years, as sandstone will do. At one point it was used to store gunpowder (hence the name). Next to the Powder Tower we took a quick look at Municipal House, an Art Nouveau building dating back to 1905. Today it's used as a ballroom and a concert hall, but before the current building was constructed here, it was the site of the Royal Palace for the King of Bohemia. The mosaic over the entrance is known as Homage to Prague (I can't remember the name of the artist, though). Inside, it features artwork by famous Prague Art Nouveau practitioner (and college dorm favorite), Alphons Mucha. We strolled along until we got to a statue of Prague writer Franz Kafka riding on top of a disembodied suit (from his short story "Description of a Struggle") that marks the entrance to Prague's Jewish Quarter. Franz Kafka and a disembodied suit at the entrance to Prague's Jewish Quarter. Right next to the Kafka statue, stands the impressive and striking Spanish Synagogue. It was built in 1868 on top of the site of Prague's oldest synagogue, and despite its Moorish design, it was always used as a Synagogue. As incredible as it is on the outside, the interiors are even more spectacular. A few blocks away from the Spanish Synagogue is one of the first buildings built in the Gothic style: the Altneu (Old New) Synagogue. The Old-New Synagogue was built in 1270 and is Europe's oldest operating synagogue. When it was built, there was another, older synagogue (the ancient one that was replaced by the Spanish Synagogue), so it was the New Synagogue. But then other synagogue swere built and it became the Old New Synagogue. The Old-New Synagogue is notable for being where the infamous Golem of Prague created by Rabbi Juddah Loew is kept in the attic. You can tour the Synagogue (we didn't), but the attic is off limits, lest any human once again unleash the terrifying Golem by accident. In fact, the superstition and fear about the Golem is so strong, that during German occupation, it's said the Gestapo wouldn't enter the attic, which saved the Synagogue from destruction. Just down the street from the Old New Cemetery, Hannah showed us where we could visit the famous Prague Jewish Cemetery, We didn't stop there on the tour, but we went back a few days later. It was amazing, but this post is getting really long, so we'll talk about that later. 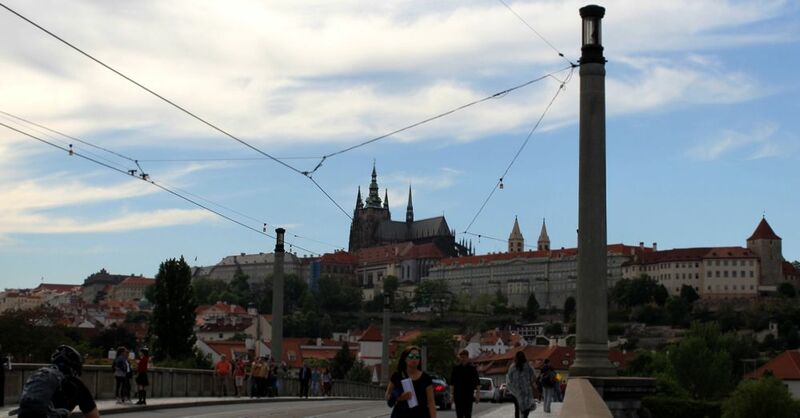 Then we left the Jewish Quarter and walked over and took in views of the Charles Bridge and Prague Castle, the largest ancient castle in the world that was the seat of the Kings of Bohemia and the Holy Roman Emperors. We didn't go inside, nor did we get very close, but it looked mighty large. And then our tour was over. We'd seen a lot and learned a lot, and, as happens with the Sandeman's tours, we were left with plenty ideas for places to visit over the next few days. On the way back to the tram stop, we stopped off to try a trdelník, which looked and tasted a lot like the kürtőskalács (chimney cake) we had in Romania.